i’ve been working my way through the wario land series, and the next one up was wario land 4 for GBA, and actually one of the earliest releases for the system. i don’t have a whole lot to say about this game, actually, as it’s quite similar to WL2 and WL3; most of wario’s transformations are back, and i don’t think any new ones were added. the visuals are quite nice, and the game mixes things up a bit by incorporating a somewhat slightly warioware-tinged presentation (although WL4 precedes it by a year and a half the two share some of the same voice samples and level groupings (e.g. “nature”)). the biggest change is that the game requires you to find a switch on each level, and once you press it a timer goes off and you have to race back to the start of the level before it runs out. since the route back to the start of the level is often quite different from the route to get to the switch this gameplay mechanic isn’t too much of a burden, although it doesn’t really seem to add much to the game itself. another change is that instead of repeated forays into a level as in WL3, all the levels are self-contained. although you can return to levels to find crystals worth more points in order to earn a higher ranking or a CD to unlock a track in the in-game sound collection, there’s not much motivation to do so. the game apparently features two harder settings that require you to find these often hidden or hard-to-get-to locations instead of having them be optional. all in all this was a decent entry to the series, although it’s on the short side (only 16 levels and a handful of boss fights) and has the disadvantage of coming after the excellent wario land 3. for newcomers to the series this is a wholly viable entry point, although for long-time fans it just doesn’t offer much that’s distinctive with the exception of a few levels early on that are quite brilliant. the new year often sees me playing through sequels that i hadn’t gotten a chance to play through the previous year, and this year was no exception. i kicked things off with wario land 3 for game boy color. i’d enjoyed playing the first three games in the series (for those following along at home, recall that WL3 is actually the 4th game in the series due to the virtual boy entry in betwen WL1 and WL2), but i had been fairly disappointed in wario land II, so i wasn’t sure if i was going to skip over WL3 or not since i knew it was going to be very similar. but in turns out that god is in the details, and although on the surface the two games are quite similar, in my opinion WL3 is by far the better game. maybe part of the reason i enjoyed it so much more is that since i already knew there would be a fair amount of backtracking (due to the fact that wario can’t die) that core design decision didn’t bother me nearly as much as before. either that or the backtracking was lessened somewhat in this game. the biggest addition to the gameplay is that each level has four treasures to find. the first time through a level you’ll only be able to find one of the treasures, but as the game progresses the layout of the levels evolve and wario finds power upgrades so that completely new and distinct areas become accessible. the power upgrades aren’t anything too surprising for long-time fans of the series, but the ways the levels change makes returning to them multiple times thoroughly worthwhile instead of a chore (somewhat like what i believe happens in the wiiware game fluidity, although i’ve only played the preview of that game so far). instead of relying completely on artificial metroid-like hindrances like doors of a certain color (although there are a fair number of those kinds of obstacles), levels gain new features due to between-level events like water draining or beanstalks growing or snakes appearing. after a certain point the game becomes non-linear to a certain extent since you can choose to return to a previous stage that has changed or explore a new one, and you can beat the game with about half of the treasures. the game has several built-in mechanics to remind you where you can go next to find an accessible treasure you haven’t gotten yet, and after all four treasures in a level become accessible you can then try to find all 8 music coins, which definitely adds to the game’s depth and longevity. although i enjoyed my time with wario land 3, when it came to ranking it i hesitated. there are definitely some things that were annoying about the game, such as the aforementioned backtracking, the golf mini-game that you have to play too many times in order to progress, and the occasional clunky boss battle. since wario’s transformations are dependent on enemies affecting him, it also gets to be annoying that the majority of the transformations require you to wait for them to wear off. but these complaints end up being significantly outweighed by what the game does right: it has so many of the things i’ve found to be key factors in really successful platformers, including colorful and varied locales, fun characters and powerups, tight controls, a smooth progression, and new elements introduced at virtually every turn but all in keeping with the game’s universe. wario’s looney-tunes-esque transformations are as enjoyable as the last game, and he continues to be an endearing anti-hero. in the end, after my somewhat curmudgeonly take on my past year of gaming i had to give this game the credit it deserves and give it a spot on my “greatest games of all time” list. a hearty cheer for wario land 3, and i’m looking forward to continuing on with this great series. 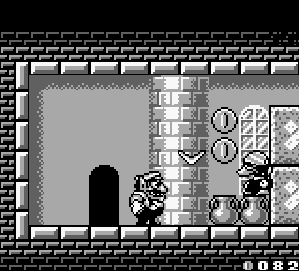 finally played through pretty much all the levels in wario land II for game boy (which was also released a bit later as a colorized version for game boy color). i really wanted to like this game more than i did, because i had quite enjoyed the first two wario land games i had played (as recounted here and here). 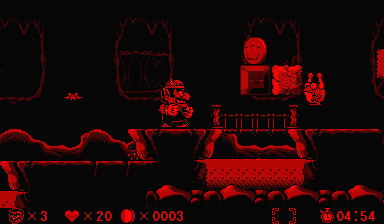 the first sequel, on the virtual boy, was extremely similar to the original wario land game, but this game offers a new twist. here wario, perhaps due to his brute strength, somehow acquires invincibility, and instead of hats his rasputin-like powers come from his ability to transcend death and other ailments. when he gets struck by a hammer, he becomes a spring; when he gets squished by a heavy weight he becomes as thin as paper; and during the course of his adventure he also survives getting burned and frozen and even eating too much cake. the powers aren’t really anything new and they’re generally underused, but the looney-tunes-cartoon-like aesthetic (carried over into the sound effects and music) is entertaining, and in his third solo outing wario is still a fun, greedy-yet-somehow-also-lovable, character. so what was the problem? unfortunately, the game suffers from one huge design choice that i just couldn’t accept, which follows directly from the fact that wario is invincible. since nothing can hurt him, instead of losing life when wario gets hit by an enemy, most of the time he loses coins. this works out fairly well because each level includes two simple mini-games that cost coins to play and yield the game’s two types of useless collectibles. so the more money you have the easier it is to collect everything in the game. all that is fine and good, but the problem comes when, instead of losing money when you make a mistake, the game punishes you by forcing you into an area where you have to backtrack to where you just were. this particularly happens during boss fights (where in general you can’t get hit once, because otherwise you have to schlep your way back to the boss room), although it happens in other places as well where in other games there would have been a certain amount of “try and die” gameplay. this backtracking happens all too often and makes the game quite annoying and dully repetitive at times. i’m surprised the game seems to have gotten such a good reception given this huge limitation in the game design. the other main problem is that many of the stages have “secrets”, such as the previously mentioned useless collectibles and also a handful of alternate exits and also just secret stashes of coins. some of the “secrets” are a simple matter of picking the right power to apply to the situation, but some of them are just trying wario’s various powers at every dead end in hopes of uncovering a hidden room. this reminded me far too much of the complaints people had about milon’s secret castle, and many times finding the secrets in this game felt even more arbitrary (and tedious) than in that one. all in all this was one of the more-disappointing first-party games i’ve played by my beloved nintendo. apparently WL3 is very similar to this one, and i’m sorely tempted to skip it. i played a bit of WL4 and it also feels pretty similar, so i may have to make an exception to my usual OCD habit of playing games sequentially and instead skip forward to other entries in the series. we’ll see. – nice history of wario (and waluigi) at kombo.com: part 1 and part 2.
another gaming first, i finished my first virtual boy game, wario land. i’d gotten a virtual boy a while back b/c it’s just way too cool and b/c i’m a nintendo fanboy, even though there wasn’t much i was itching to play on it. but i’d played and enjoyed the first wario land game (on the game boy) last year, so i was interested in delving deeper into the series. 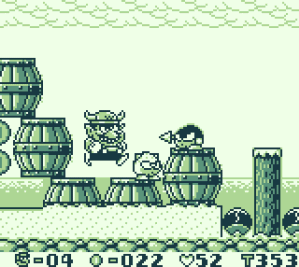 although the VB wario land is the second game in the series, the “wario land 2” moniker was actually given to the game that followed VB wario land, when the series returned to the game boy. VB wario land is an enjoyable game, despite being extremely similar to the previous game and including virtually the exact same powerups. the game generally makes good use of the 3D perspective, and the treasures are hidden well enough that you’ll be scratching your head more than once as you search for them. another plus is that there’s a harder version of the game unlocked after you beat the game, which apparently includes more spikes and other hazards. and although i haven’t found anywhere else that mentions it, the second quest also gives you different treasures, e.g. instead of a lucky cat statue as the treasure for the first level it’s a raccoon statue. all in all this is a solid platformer, and despite some weak boss battles overall this one’s as entertaining as the first wario land game. prob. not worth going out of your way to get a VB to play this game unless you’re a hard-core nintendo fanboy like me, although it remains to be seen how far the next games in the series evolve. zipped through the first wario land game (for the original game boy) this week. as you may know, the game is sub-titled “super mario land 3” but has pretty much nothing to do w/ super mario land 2 (which i reviewed a year ago here). wario land features the newly minted nemesis from that game in the starring role, and although it’s a fairly typical platformer, it’s a breath of fresh air from the regular mario series. 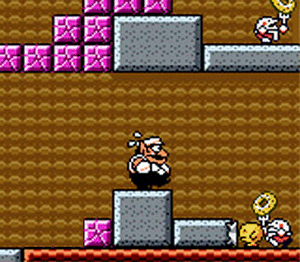 instead of jumping on enemies as with mario, here wario uses brute force to charge into them and flip them over. powerups are provided in the form of three hats, a dragon hat (which enables you to shoot fire), a bull hat (increases charge ability and speed), and a jet hat (for flying). the gameplay, as you’d expect, is tight, and there are several moments of brilliance scattered throughout. there’s also an increased emphasis on exploring, more so than in super mario world (1990) or mario land 2 (1992), which is enjoyable. this game (from 1994) has 15 treasures hidden among its 40 levels which really adds to the gameplay in a way that collecting dinosaur coins in mario world didn’t, along with a handful of second exits. the different endings, dependent on how many coins and treasures you have, do a good job providing additional motivation to not just rush through each level. all of this along with entertaining enemies and graphics and good music make this one worth playing, despite its only mild difficulty. 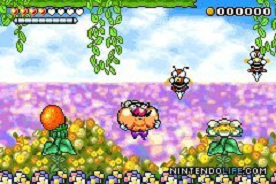 like sml2, wario land was also developed by nintendo’s R&D1. i’ve inadvertently played a lot of their games, so i’m going to have to work my way through the rest of them. and yes i def. have wario land 2 lined up for next year.